The rollout of 3G services and further enhancement of existing 2G networks by the telecom service providers could see some delay as there has been no import of related equipment over the last three months. The department of telecommunications (DoT) in March this year said it wanted service providers to include a clause in the purchase order, stating their equipment provider should do transfer of technology (ToT) of the equipment and software to India within the next three years. This was to overcome security concerns and increase manufacturing in India. Also, service providers will have to apply for security clearance for procurement of equipment/software, which shall be granted by the DoT within 30 working days. Equipment providers including Ericsson, Nokia Siemens Networks, Alcatel Lucent, ZTE and Huawei now have their assembling/manufacturing units in India. However, most equipment providers feel it is not practical to manufacture everything in India and do complete ToT. Most providers might be assembling the equipment from various technology providers and cannot do complete ToT to India. Therefore, operators have been delaying on decision taking and we havent seen any import of equipment since the last three months, said Sandeep Ladda, executive director at PricewaterhouseCoopers. A service provider, who in the recent 3G auctions won quite a number of circles, echoed similar concerns. Equipment providers are not agreeing to this mandate and therefore, we havent taken any decision on procurements. So, if there is a lack of decision empowerment, it might happen that we get 3G spectrum in September but rollouts are delayed, a senior executive of this telecom operator said. The telecom operators have been lobbing around the issue and have been in talks with the DoT to tone down the notice. The operators have further sought clarity on the term ToT, which could be interpreted in many aspects. Meanwhile, the DoT is said to be considering the issue and the industry is expecting some clarity any time soon. An executive from an equipment-provider whom FE spoke to, said, No equipment have come since then and the industry operators are suffering due to lack of possibility to expand. Moreover, China has been a more preferred location to manufacture as it brings cost benefits. Similar benefits are not available in India and therefore, if there is complete manufacturing from India, operators would not be able to pass on the cost benefits to consumers. Another equipment provider said that even if the industry is willing to move to India, the country lacks the entire eco-system which would take another three to four years to build. 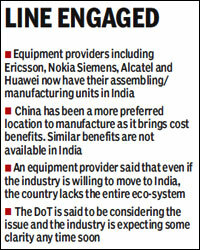 If DoT isnt taking any decisions on import of equipment for the 3G requirements, the roll-out plans could go hay wire. Equipment providers also feel that even if they manufacture in India, there cannot be a complete assurance of security as it is not very difficult to intrude in a network and introduce malware/spyware.